An Islamist attack on a Coptic Church in Cairo on Friday left four people dead. Supporters of the Muslim Brotherhood held demonttrations across the country in reaction against the official candidate in the upcoming presidential election of General Abdel Fatah al-Sisi. 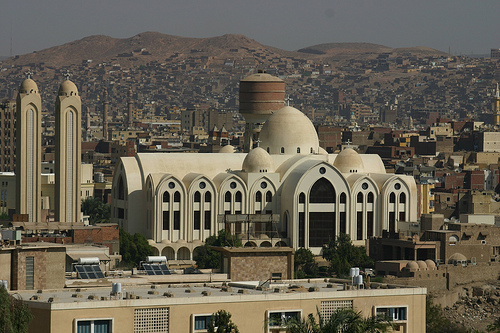 In the suburb of Ain Sham in Cairo, protesters carried out their violence against the Coptic church dedicated to the Virgin Mary and the Archangel Michael. A young woman, Sameh Merry, driving past was shot dead when the mob saw that she had a cross hanging in the front of her car. A 25 year old journalist was also killed. Bishop Raphael, secretary of the Holy Synod of the Coptic Orthodox Church, expressed words of condolences for the death of the woman.